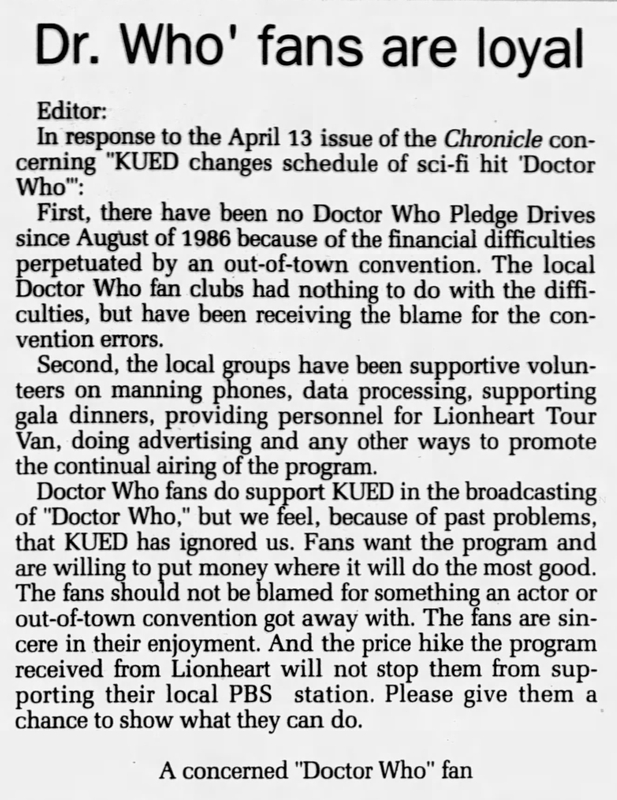 First, there have been no Doctor Who Pledge Drives since August of 1986 because of the financial difficulties perpetuated by an out-of-town convention. The local Doctor Who fan clubs had nothing to do with the difficulties, but have been receiving the blame for the convention errors. Second, the local groups have been supportive volunteers on manning phones, data processing, supporting gala dinners, providing personnel for Lionheart Tour Van, doing advertising and any other ways to promote the continual airing of the program. Doctor Who fans do support KUED in the broadcasting of "Doctor Who," but we feel, because of past problems, that KUED has ignored us. Fans want the program and are willing to put money where it will do the most good. The fans should not be blamed for something an actor or out-of-town convention got away with. The fans are sincere in their enjoyment. And the price hike the program received from Lionheart will not stop them from supporting their local PBS station. Please give them a chance to show what they can do. APA 6th ed. : (1988-04-20). Dr. Who' fans are loyal. The Daily Utah Chronicle p. 7. MLA 7th ed. : "Dr. Who' fans are loyal." The Daily Utah Chronicle [add city] 1988-04-20, 7. Print. Turabian: "Dr. Who' fans are loyal." The Daily Utah Chronicle, 1988-04-20, section, 7 edition. This page was last modified on 29 March 2019, at 03:08.